Breakfast, lunch, and drink breaks on Conference days. Evening receptions on Monday, October 29th and Tuesday, October 30th. Breakfast, lunch, and drink breaks on your day(s) of training. Happy Hour on Sunday, October 28th. Laptops for hands-on training classes. Multiple registrations from the same location – $100 off each ELEVATE registration. Includes guest attendance at ELEVATE conference breakfasts, lunches, and evening receptions. Does not include attendance to any conference sessions or TRAININGDAYS events. Separate from ELEVATE conference registration. 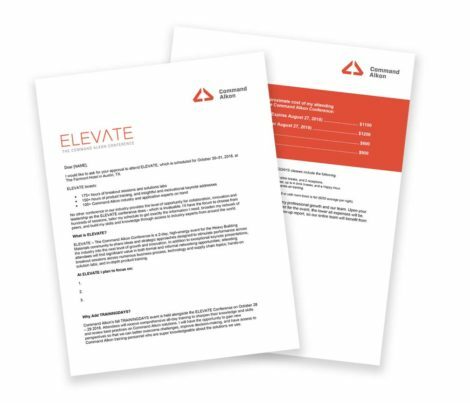 Need help getting your trip to ELEVATE approved? Use our justification letter to review the value with management and receive approval to attend the premier event for collaboration, best practices, and product training for the Heavy Building Materials community.